I have a whole slew of posts coming up for you all but this is one of my favorites in the works. I was offered some review polished from Carolyn of Liquid Sky Lacquer and when I got them I loved them so much that I ordered 3 more. I have all 9 of them here for you tonight! Please be prepared, this is a very image heavy post. 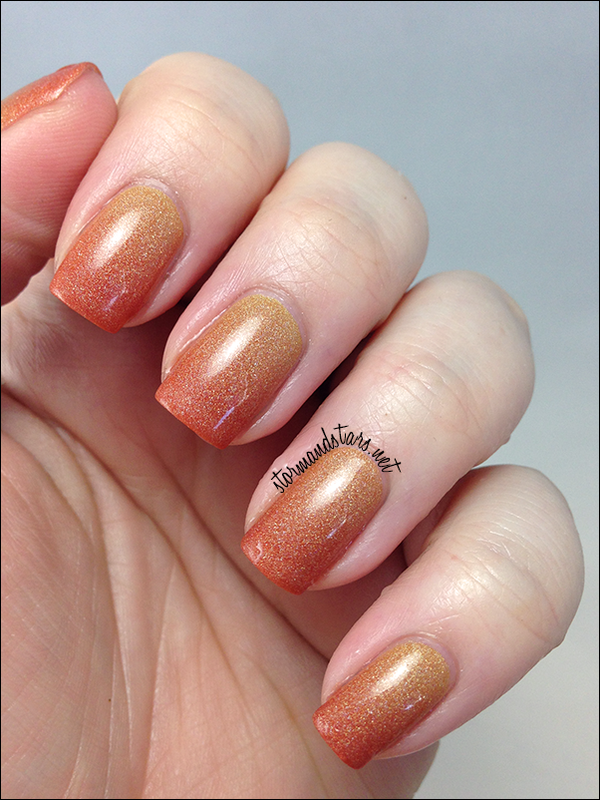 There are quite a few thermals which tend to be picture heavy on their own plus a bunch of holos. Ready to see? Lets get started! 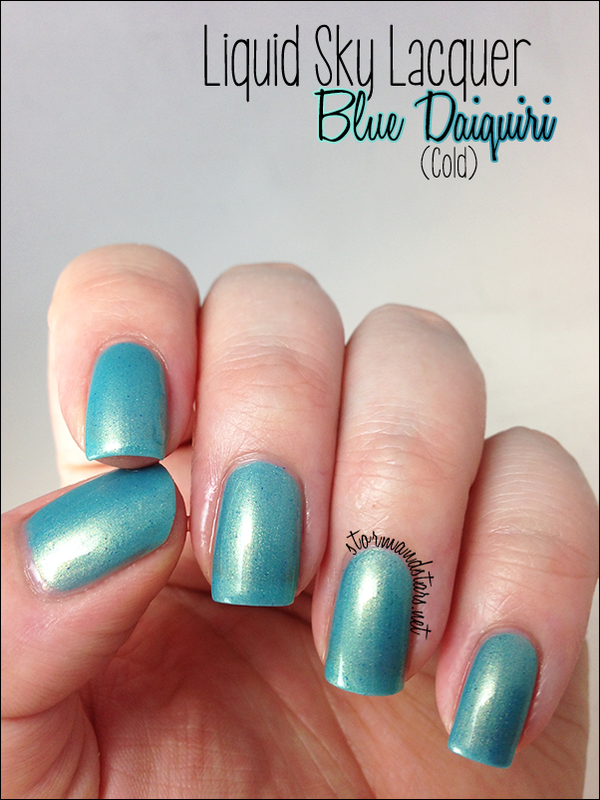 Blue Daiquiri is a beautiful teal to blue thermal polish with a gorgeous gold shimmer. 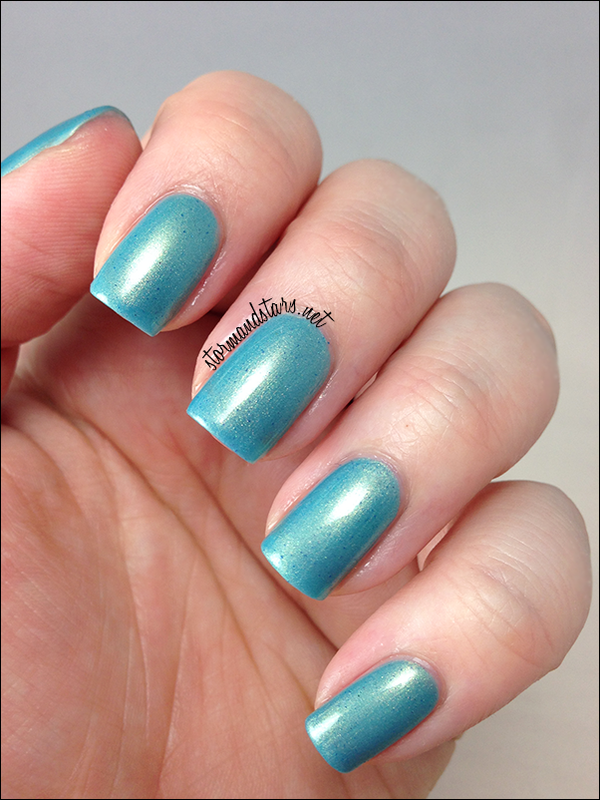 This pretty teal color is the warm stage of the polish and probably how it would be most of the time on the nail. To make the transitions between states I used warm and cold water to dip my fingers in. 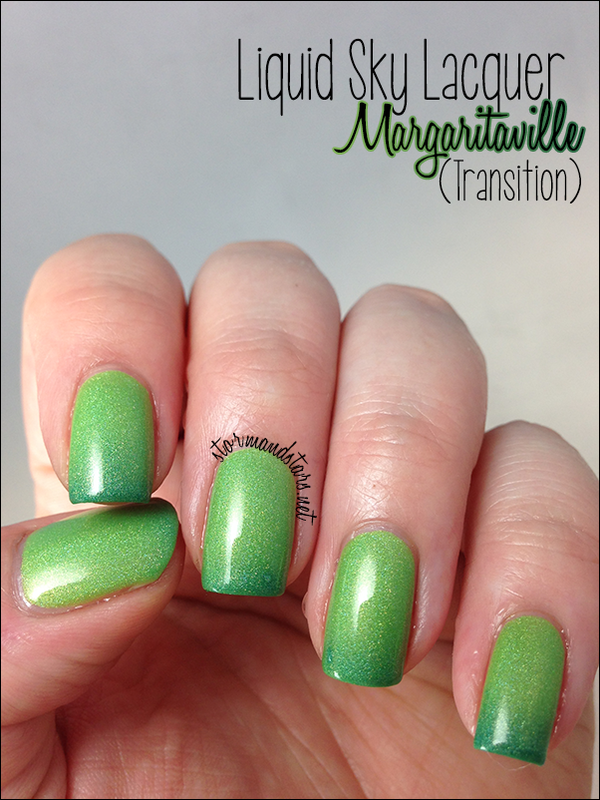 Below is the transitioning polish from warm to cold at the tips. 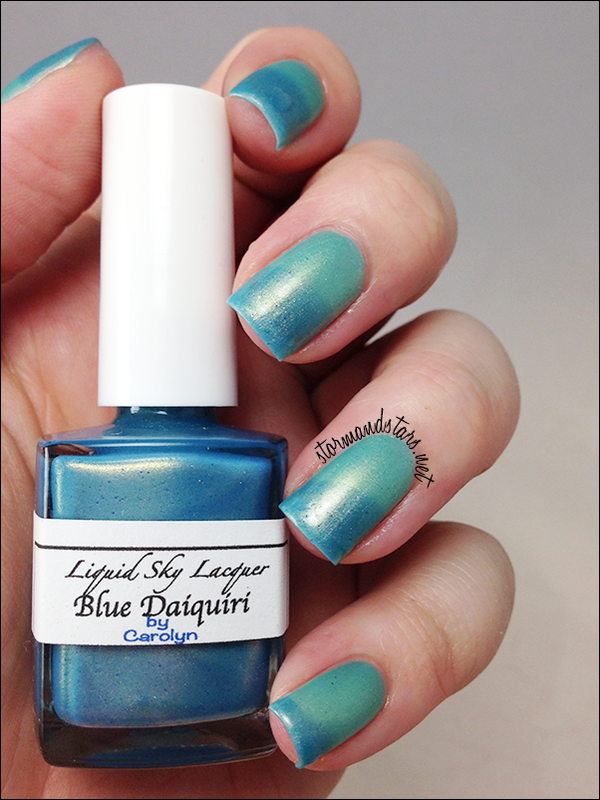 I love the subtle color shift in this polish and the color is perfect for my skin tone. 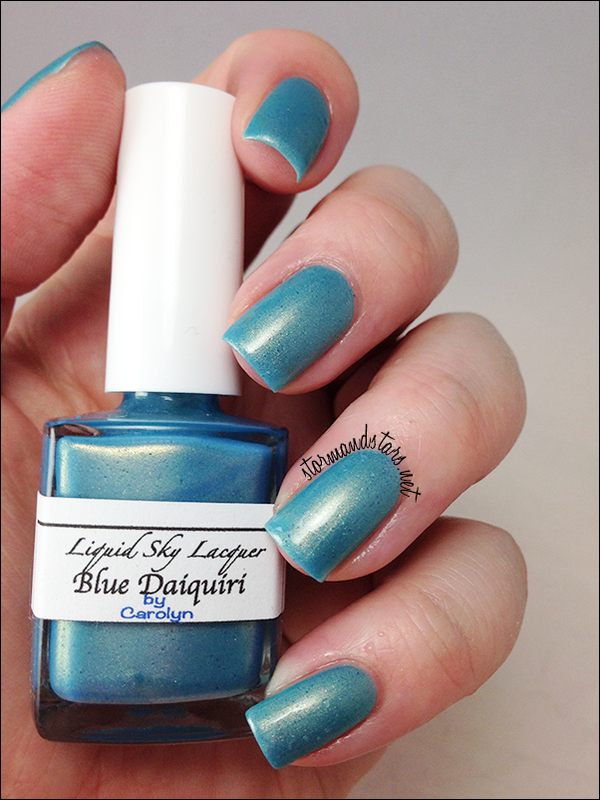 When cold Blue Daiquiri turns a super pretty blue color shown below. 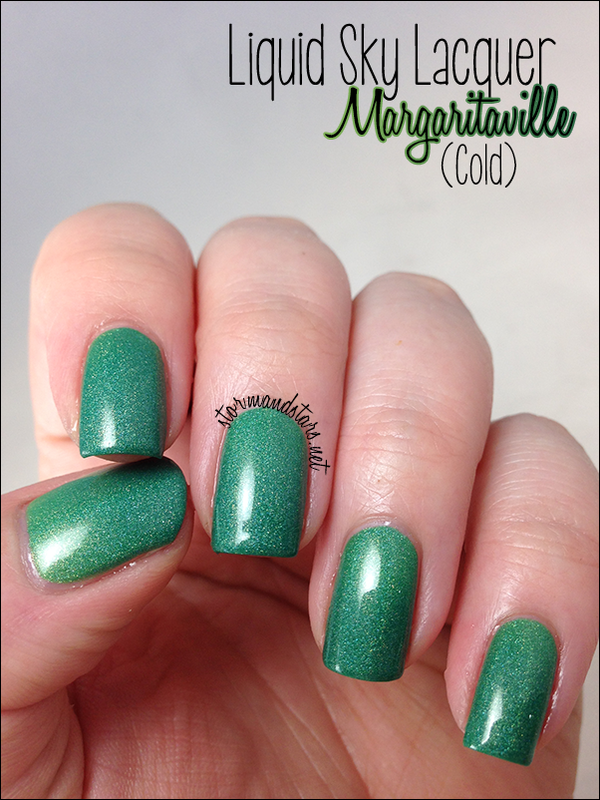 I used 4 thin coats plus topcoat for these swatches. 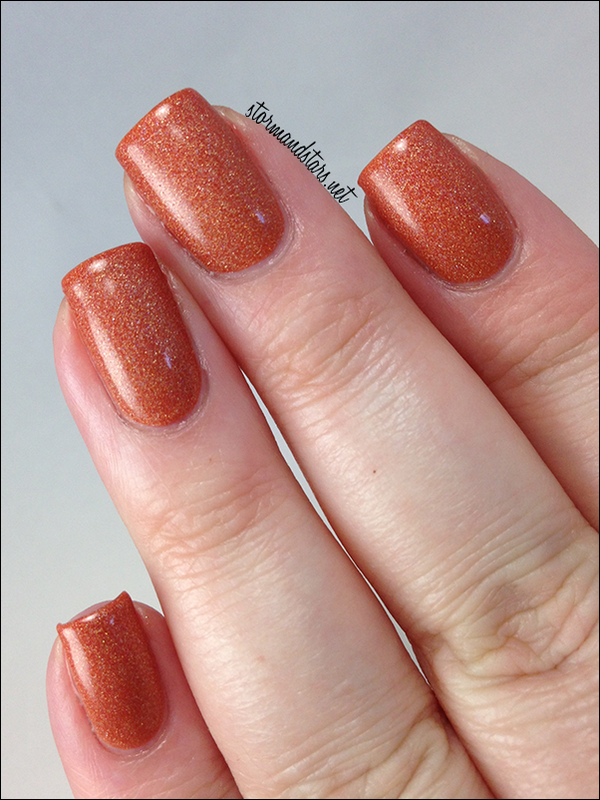 The lacquer was sheer, but if your nails are shorter you can probably get away with 3 coats. I had absolutely no formula issues. 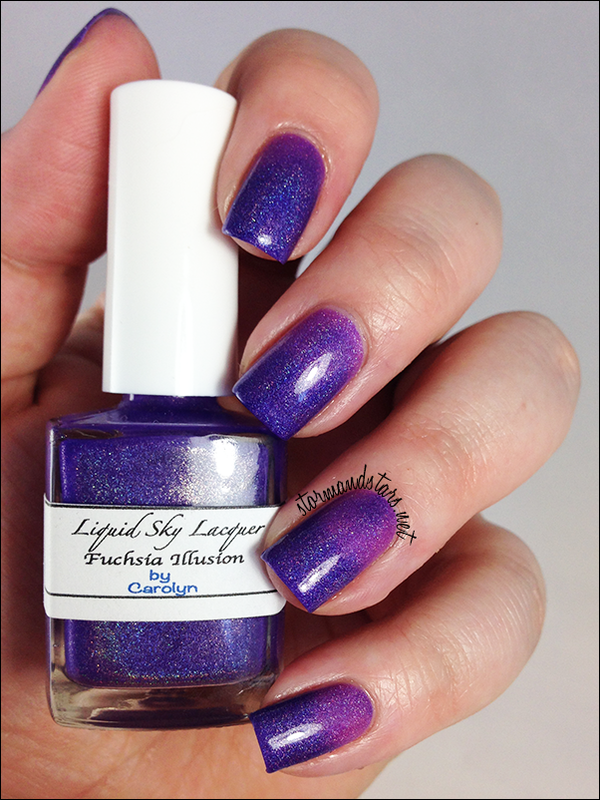 Next up is my favorite lacquer sent to me by Carolyn. 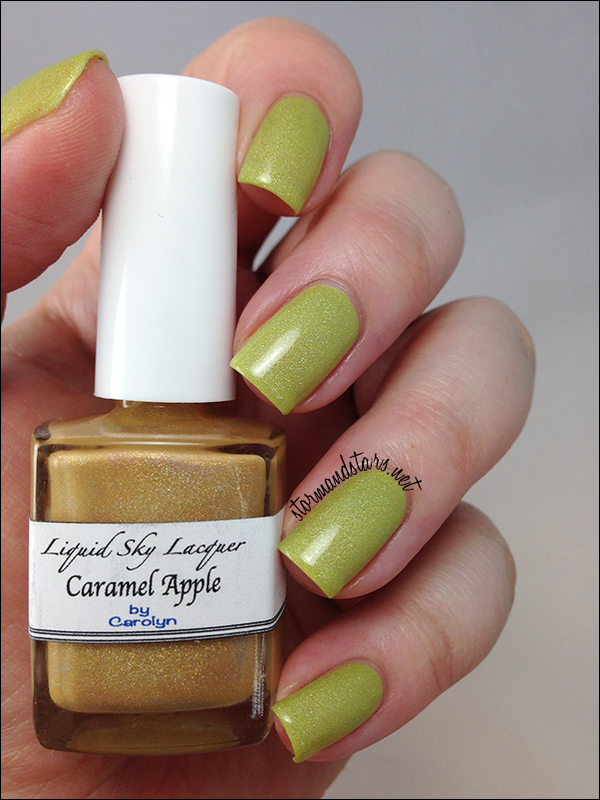 This is Caramel Apple. 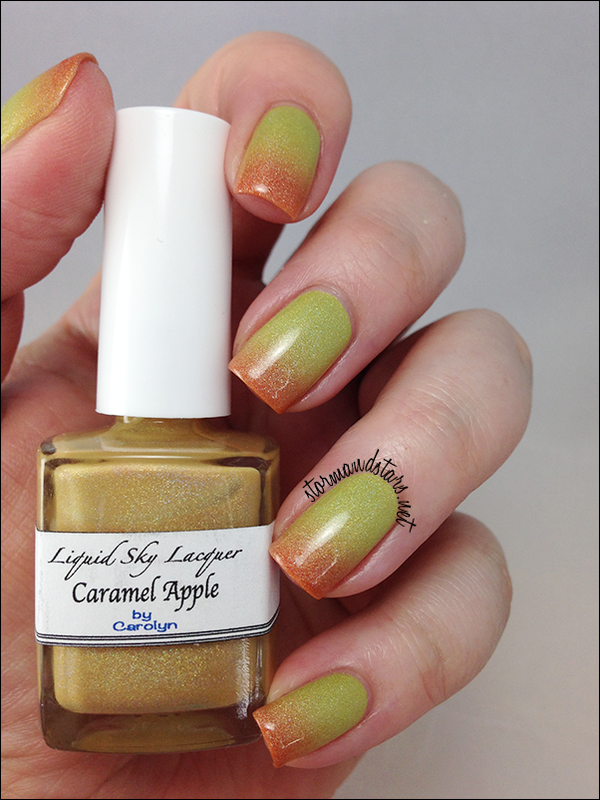 Caramel Apple is another thermal polish. 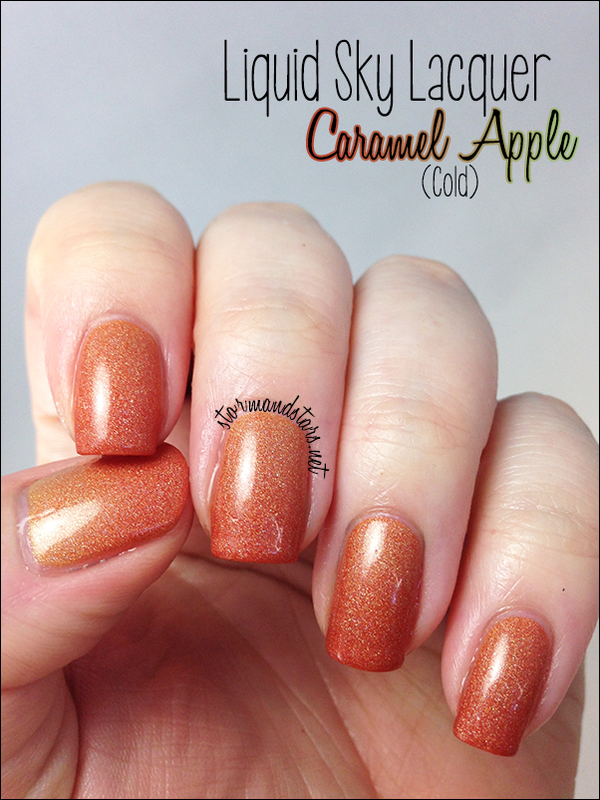 It shifts from a gorgeous granny smith green to a deep yummy caramel color. 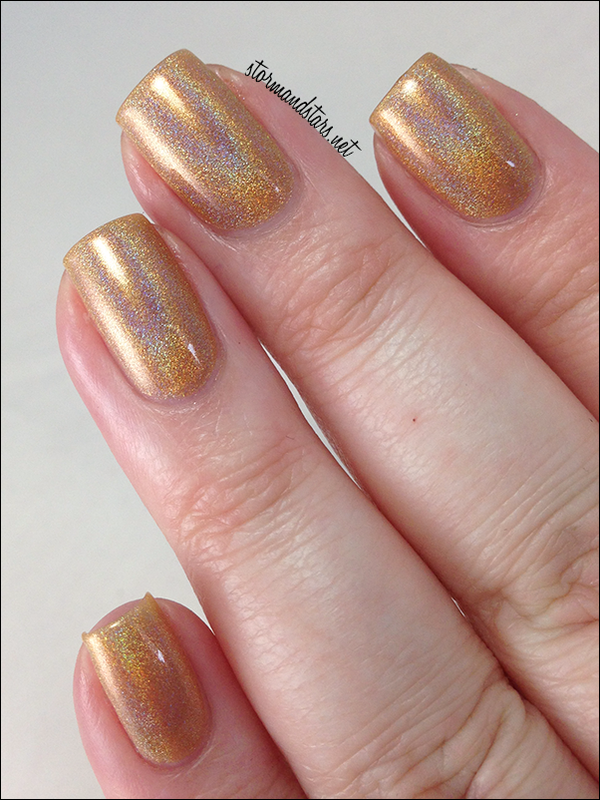 This thermal has the added bonus of also being a holo, though these photos don't show it well. 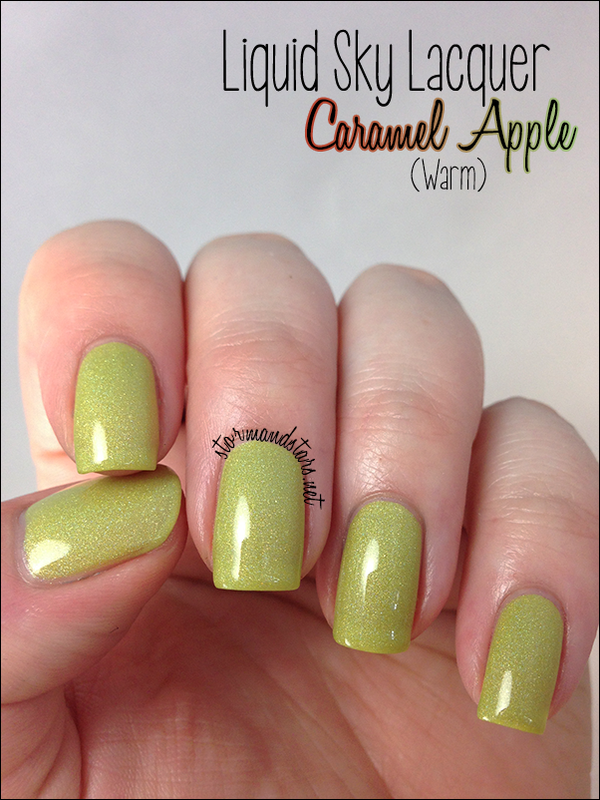 This is the warm state of Caramel Apple and where it wanted to stay the majority of the time. You can see the color starting to get cold a little in the bottle though. 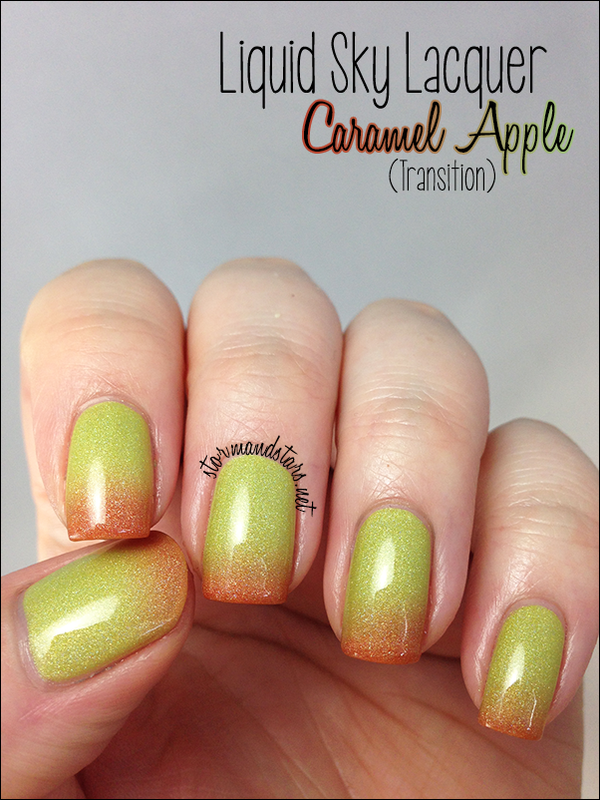 Below is the transition shift of Caramel Apple from warm to cold on the tips. Again, I used cold water to make the tips turn, but they would turn if it was cold out as well. 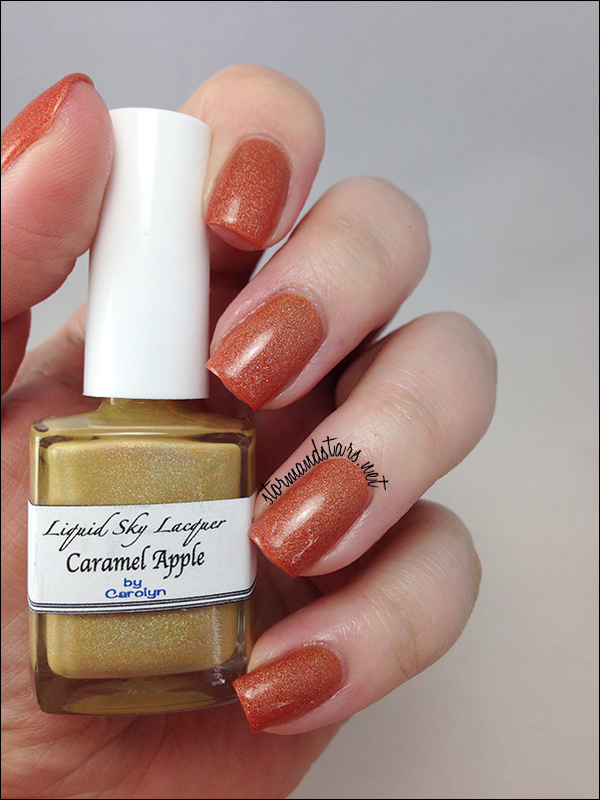 This is my favorite of all the Caramel Apple states, it really shows off both the Caramel and the Apple. Lastly for this one is the cold state, a deep almost edible looking caramel color. 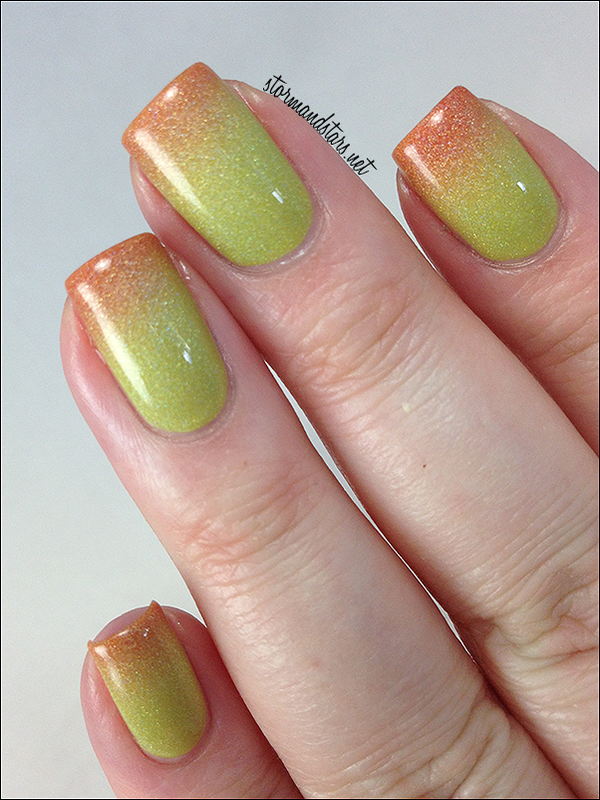 I used 3 easy coats of Caramel Apple for these photos plus topcoat. It went on perfectly. 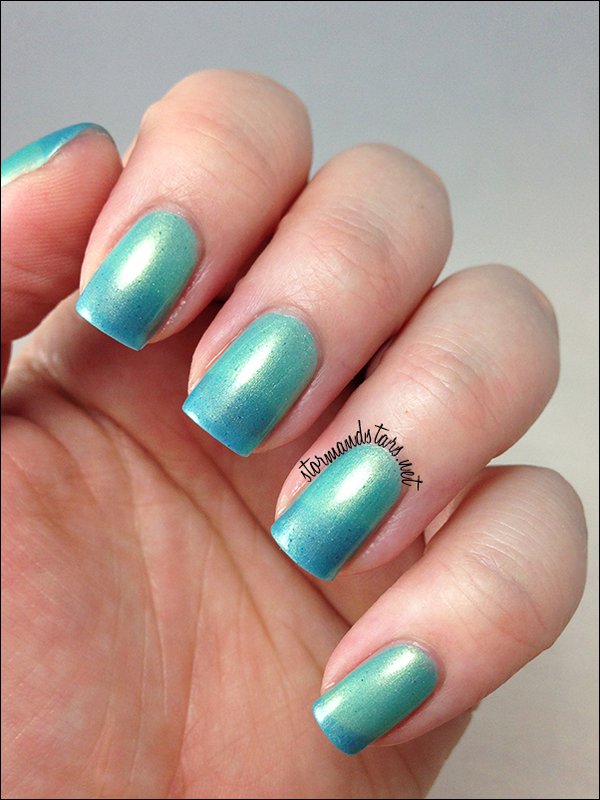 The thermal effect in this is very sensitive and it changes very easily from one color to the other. Lots of fun to play with! 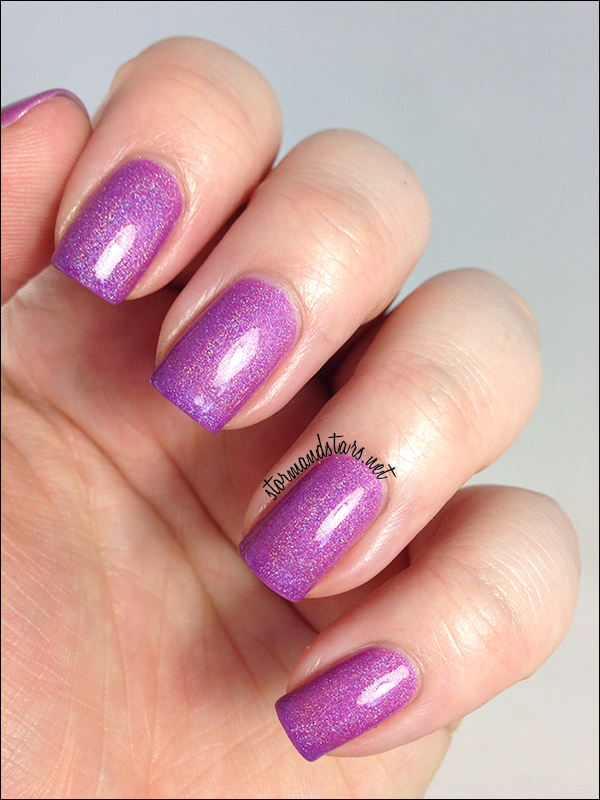 The next lacquer is the only glitter polish of this group, and was one of the ones I bought for myself. 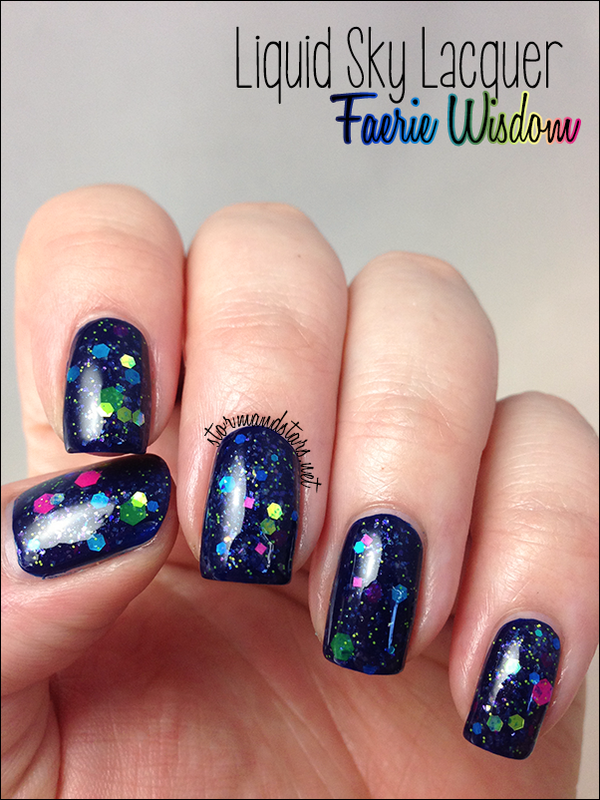 This is Faerie Wisdom. When I got this I knew I needed to layer it over Cult Nails Time Traveler. 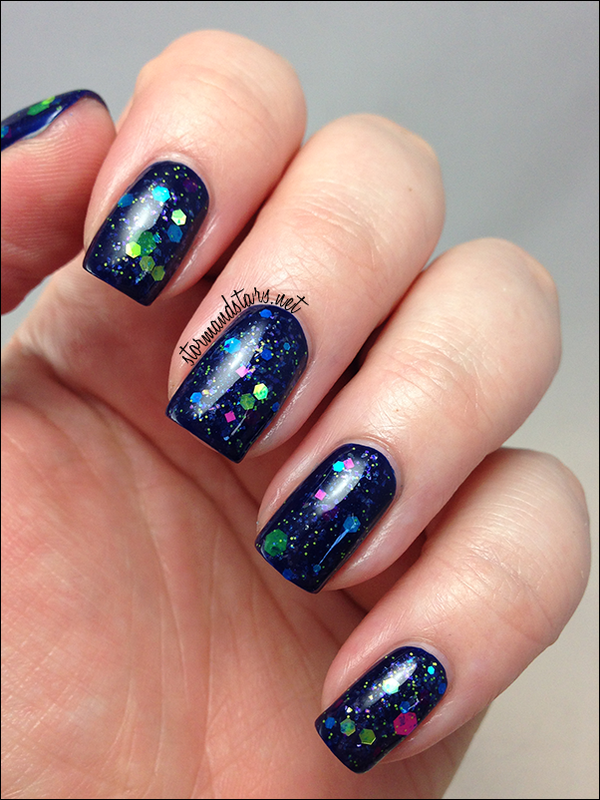 I absolutely love all the glitters and the colors make me so happy. Its super shiny and sparkly in person! I didn't have any trouble getting any of the glitters out of the bottle and the coats went on easily and with minimal glitter placement. 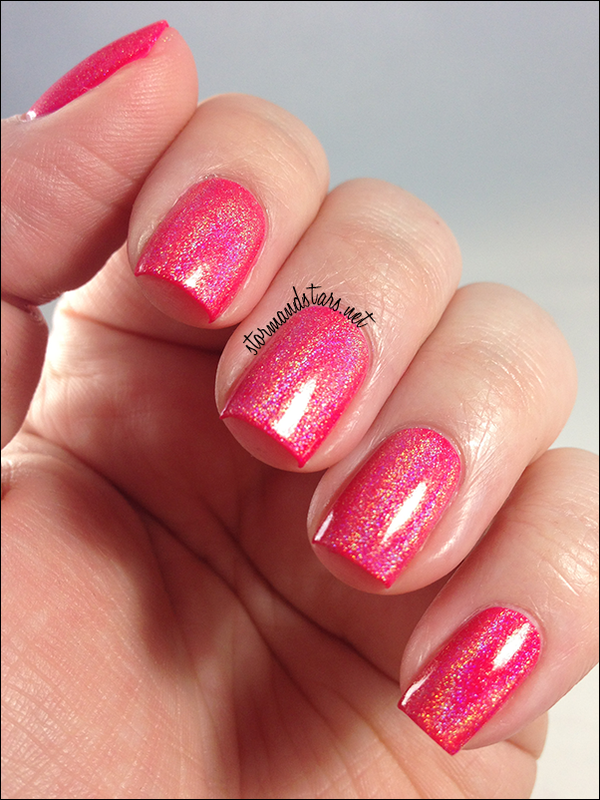 This is an other thermal polish that starts out this beautiful magenta color when warm. 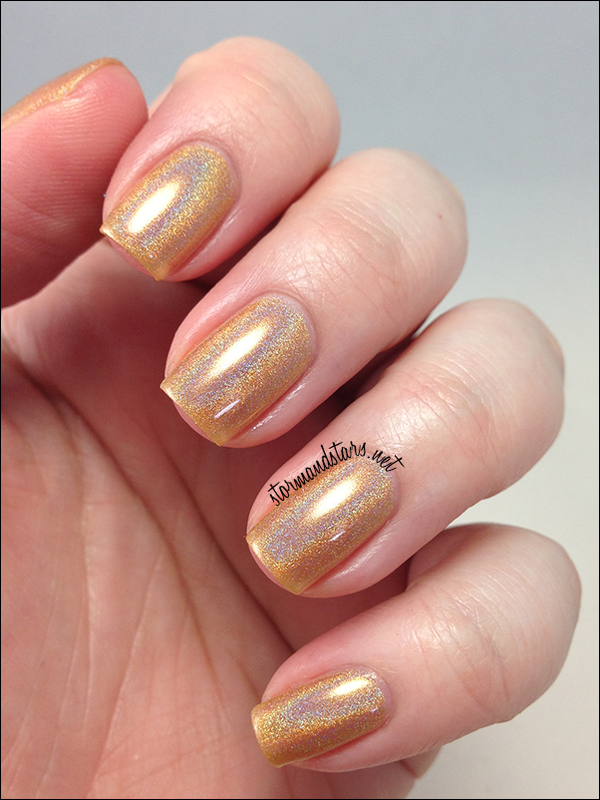 It also has a pretty strong linear holo effect. 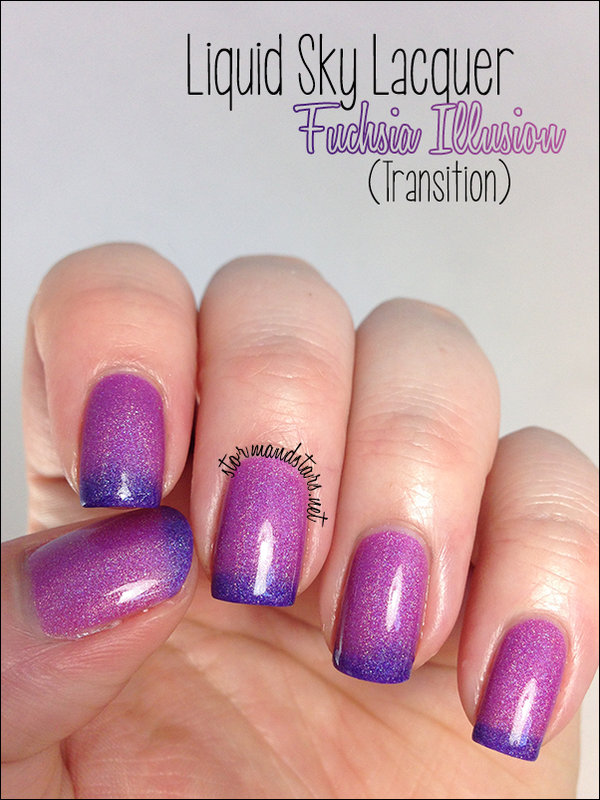 As you can see below, Fuchsia Illusion transitions to a deep purple lacquer when cold. I love how this looks when it is in transition. When I wore this one, this is the state it stayed in most of the time. Brrrrr! How about some cold! This one is just as pretty freezing cold as it is super warm. I love this one no matter which way its showing. 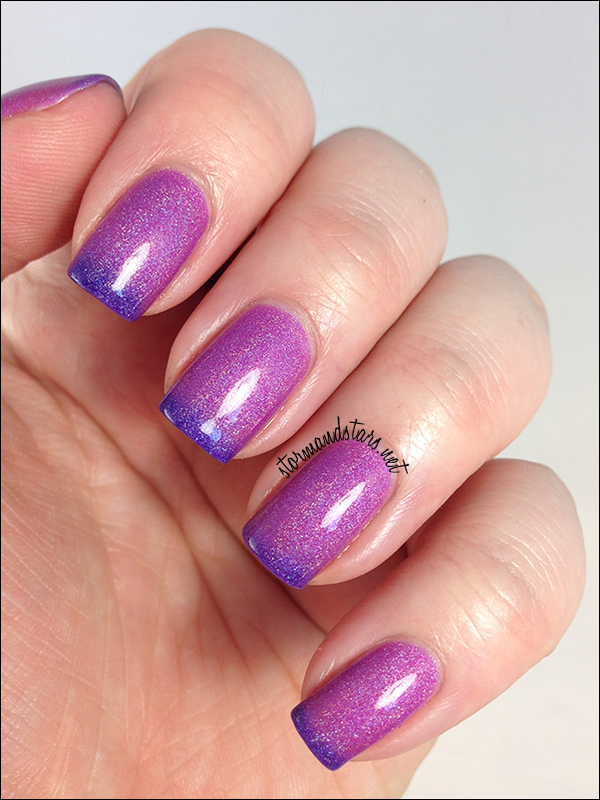 For these photos I used three coats of Fuchsia Illusion and topcoat. No formula problems, absolutely perfect. 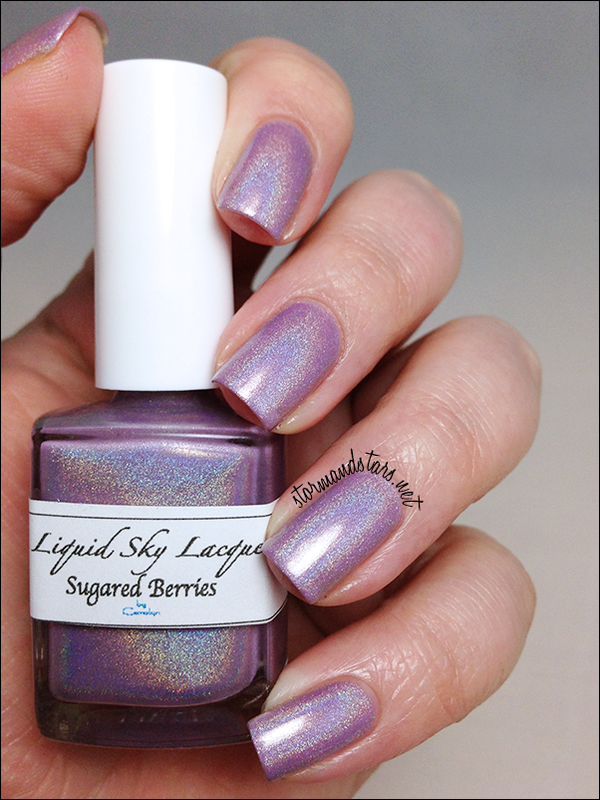 Next is the Liquid Sky Lacquer Holo Top Coat. 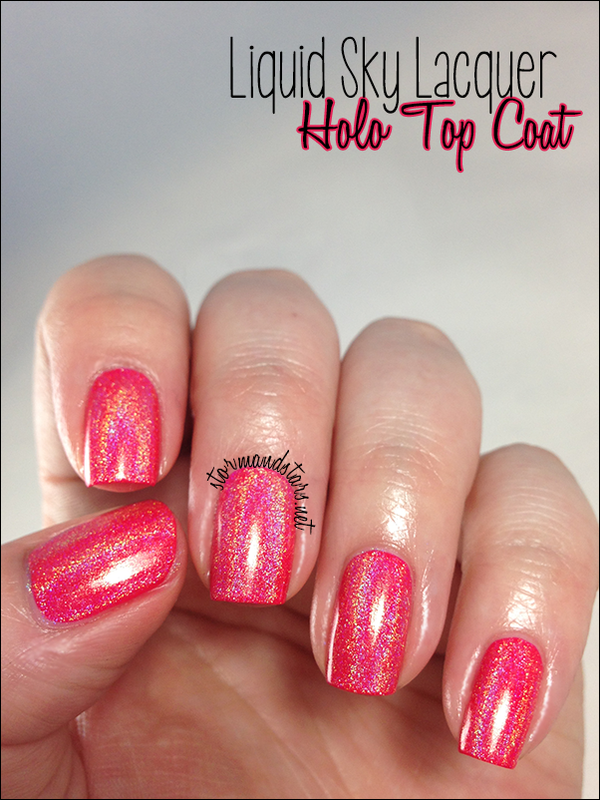 This top coat goes over any color you desire and turns it into a holo masterpiece. 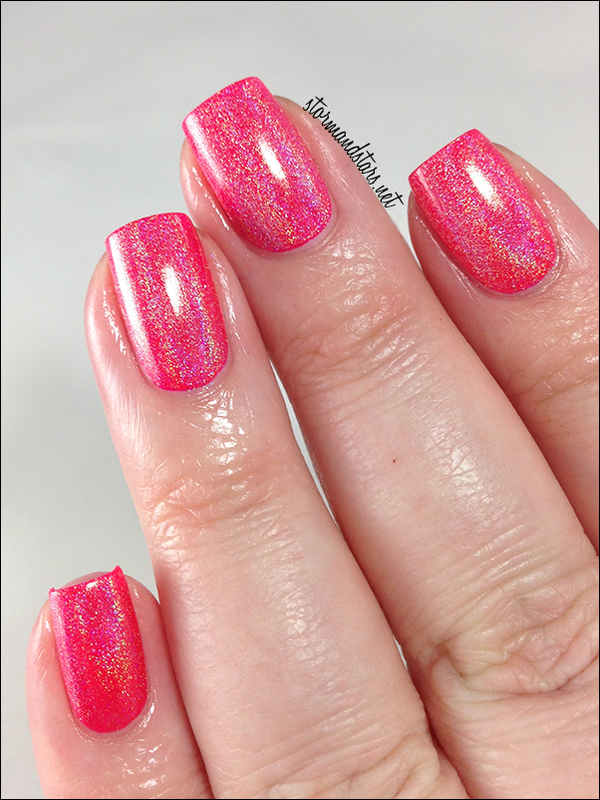 I chose to layer this one over Pop Beauty Pinkest, a super bright and deep neon pink. 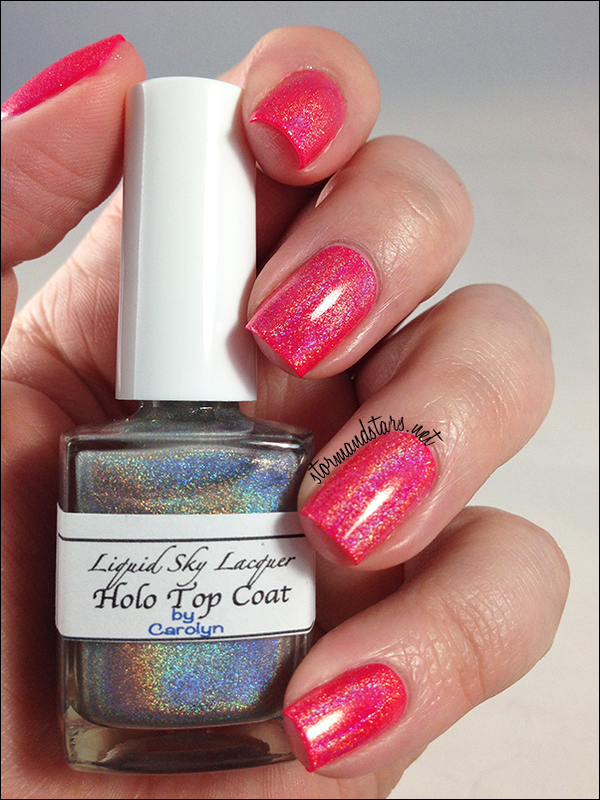 As you can see this Holo Top Coat doesn't turn the polish under it silvery like a lot of them do. I absolutely love this. This was only one coat over the undies plus topcoat. I had no problems with formula or with the SV dulling the holo effect. 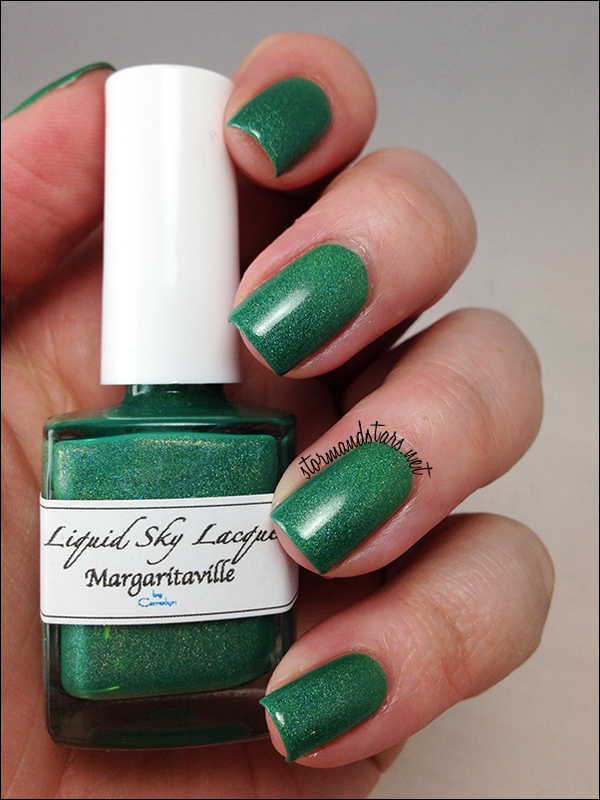 Margaritaville is another of the three I bought for myself. 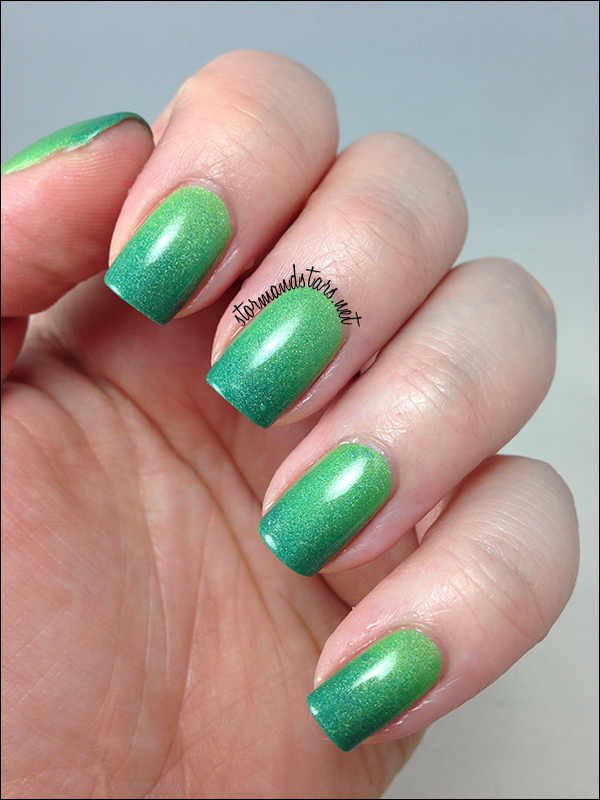 I just had to have this green thermal stunner. 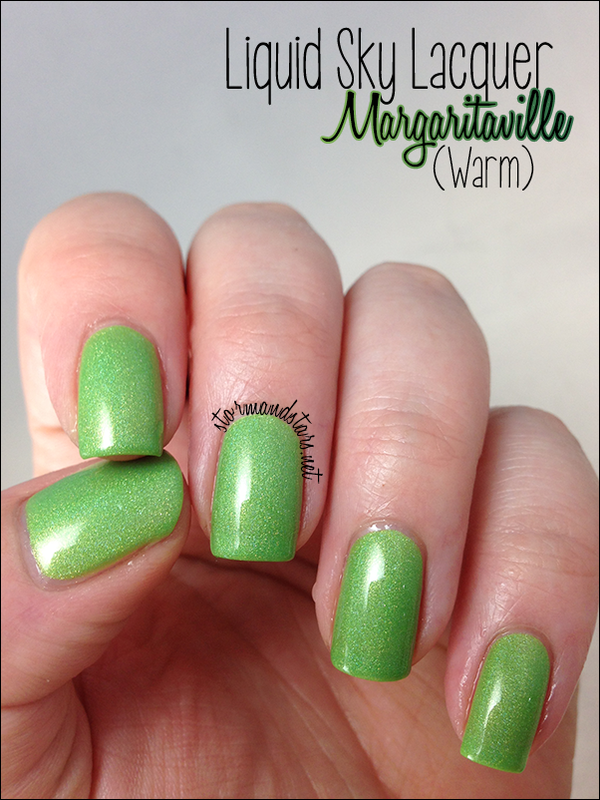 One of my favorites, bright lime green when warm with a subtle linear holo effect. When turning, this one does a fantastic job of giving that gradient effect. And freezing cold we get a deep forest green color. As with most of these I did three easy coats plus topcoat for these photos. No formula issues and the thermal changed easily for me. 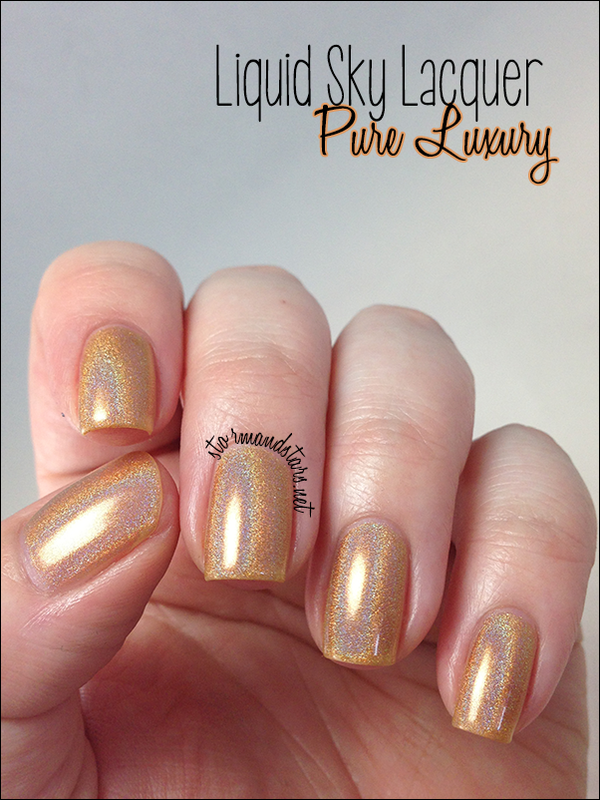 The next lacquer, Pure Luxury was the first one I put on when I received the review box from Carolyn. I could not resist its beauty. 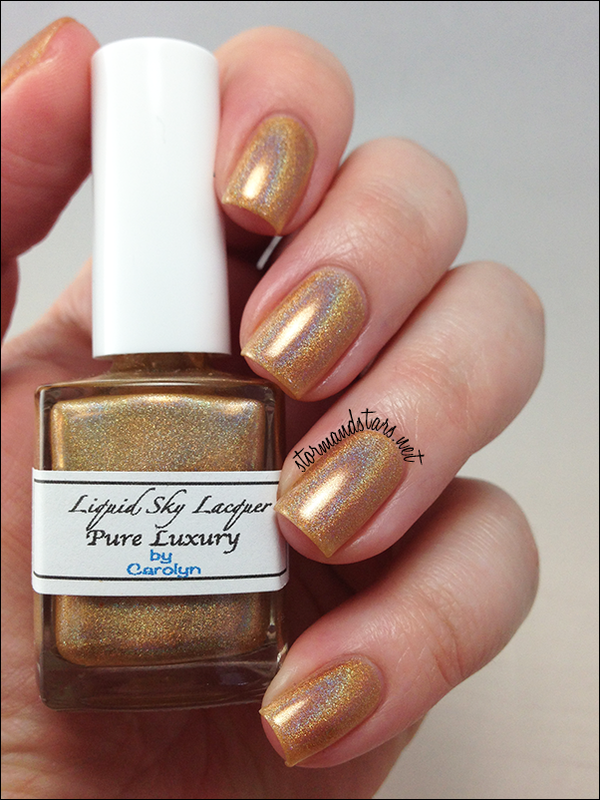 Pure Luxury is a shiny, coppery gold super strong holo polish that is just fantastic to wear. 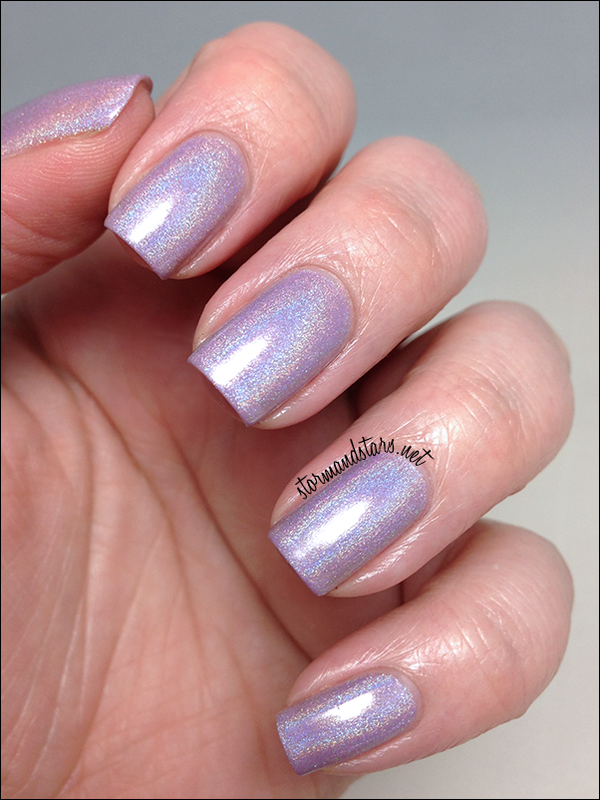 Look at all that beautiful holo goodness! 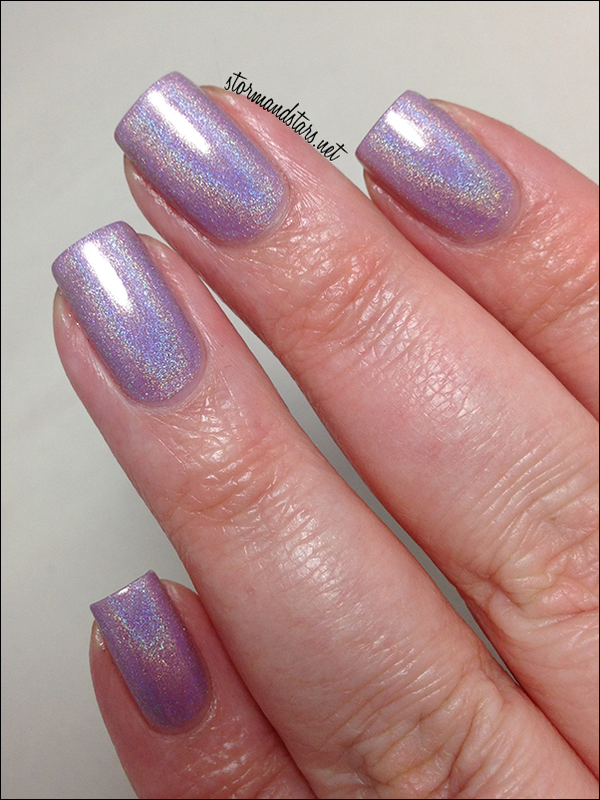 This is seriously the most holographic indie polish I own. I think I need a backup bottle. 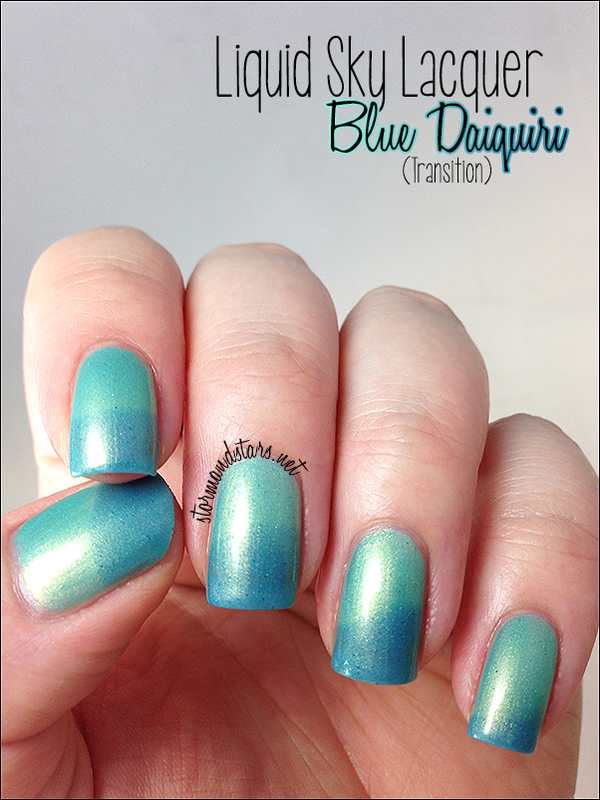 For this manicure I used four thin coats of this sheer beauty, but if I wasn't wearing it for myself and not for swatching I would have stopped at three. I'm OK with a little VNL. 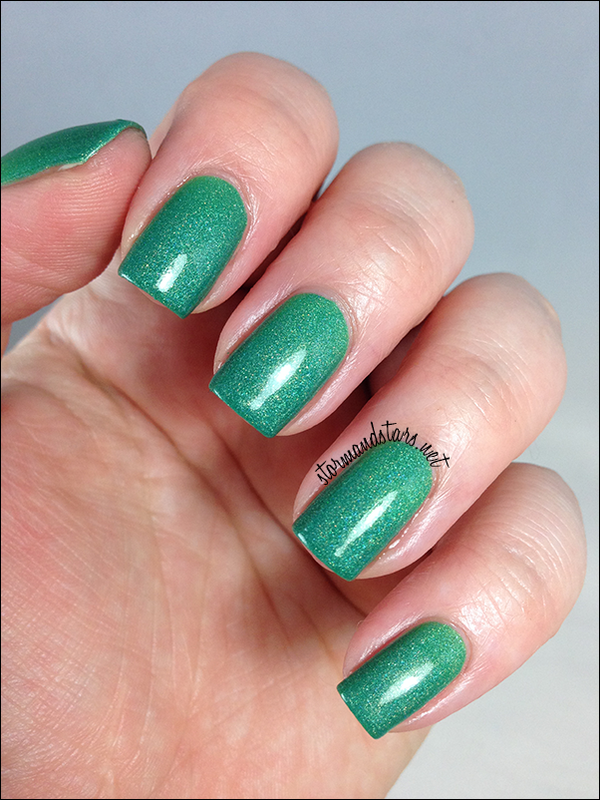 This next one is a polish I've been eyeing for quite some time. This is Sugared Berries. 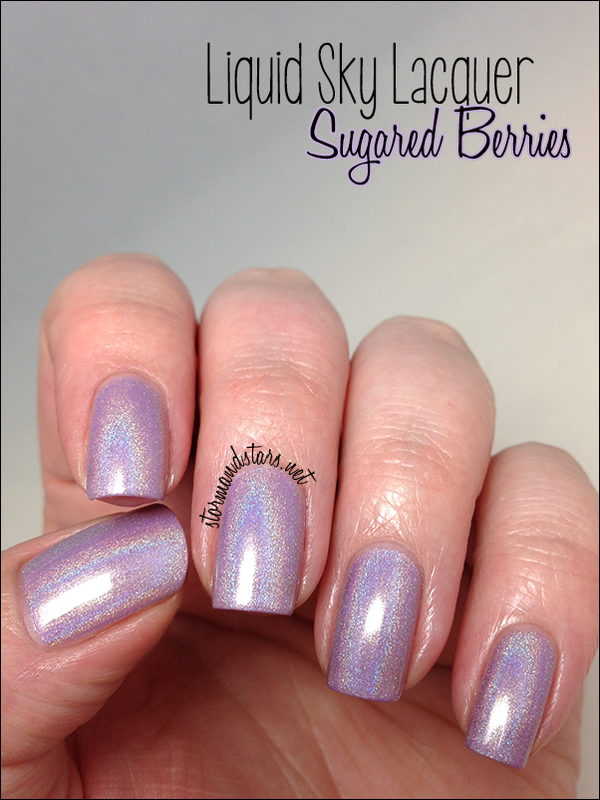 Another super strong holo polish, Sugared Berries is a very light blue leaning purple. It is so so pretty! I felt like a princess wearing this one! 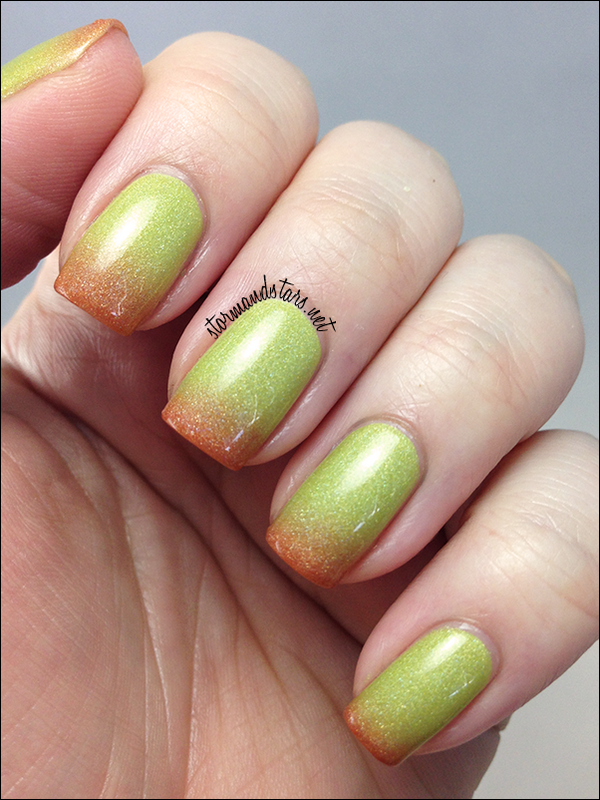 I used three coats of Sugared Berries for these swatches, with, once again, no formula issues. 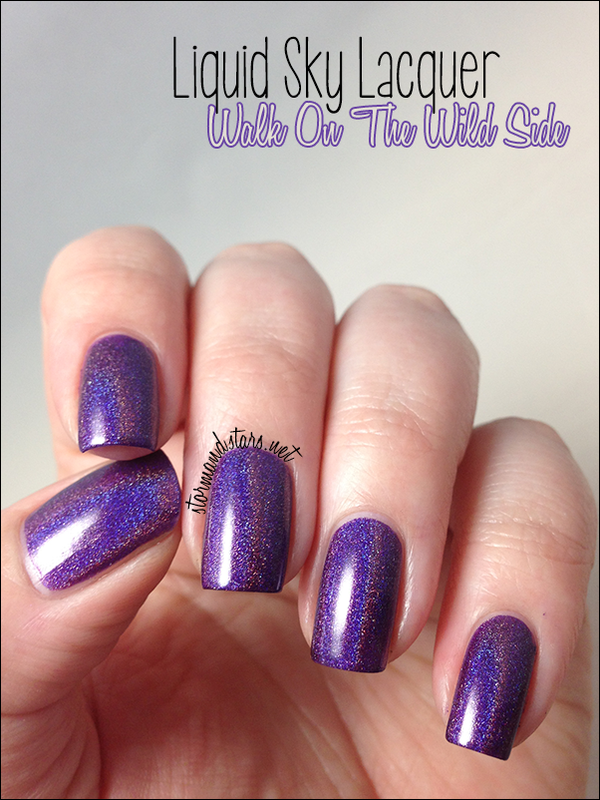 Last but certainly not least is Walk On The Wild Side. 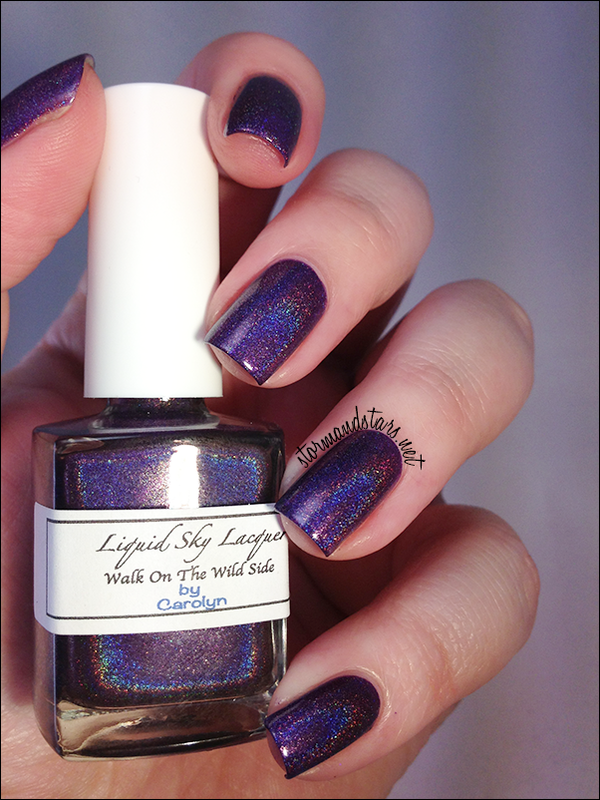 This deep purple holo polish is beautiful and opaque and I'm pretty sure you all need it. I don't know what happened with the lighting in this last photo, but it really shows the rainbow in the holo so I love it. I used three coats for these photos but probably could have gotten away with two. There was not one polish in this bunch that I didn't love and I'm sure I'll be ordering from Carolyn and Liquid Sky Lacquer again as soon as I can! 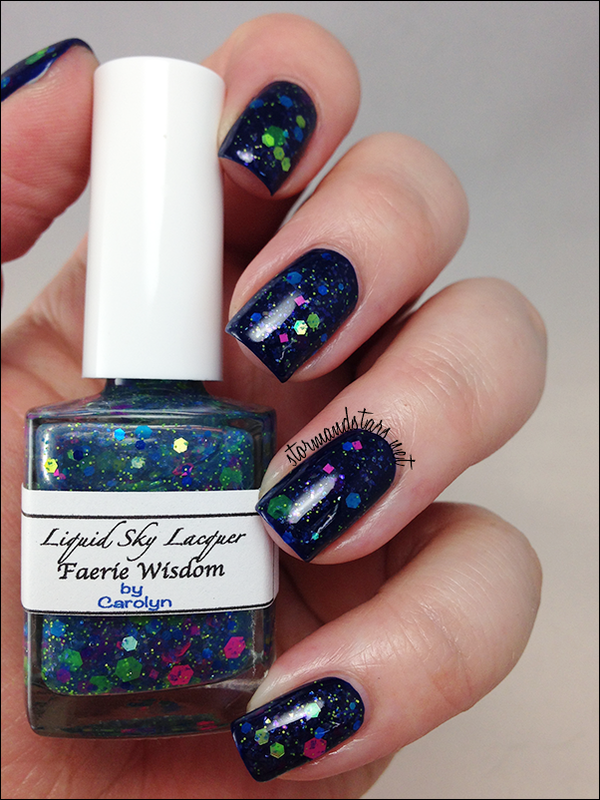 You can purchase Liquid Sky Lacquer polishes in their Shop (US) and at Mei Mei's Signatures (International) and don't forget to follow Carolyn on Instagram, Twitter and Facebook for brand updates and announcements and many more swatches and photos! The Liquid Sky Lacquer Shop is closed right now but will re-open this Saturday the 28th! MARK YOUR CALENDARS!! These are OUTSTANDING! 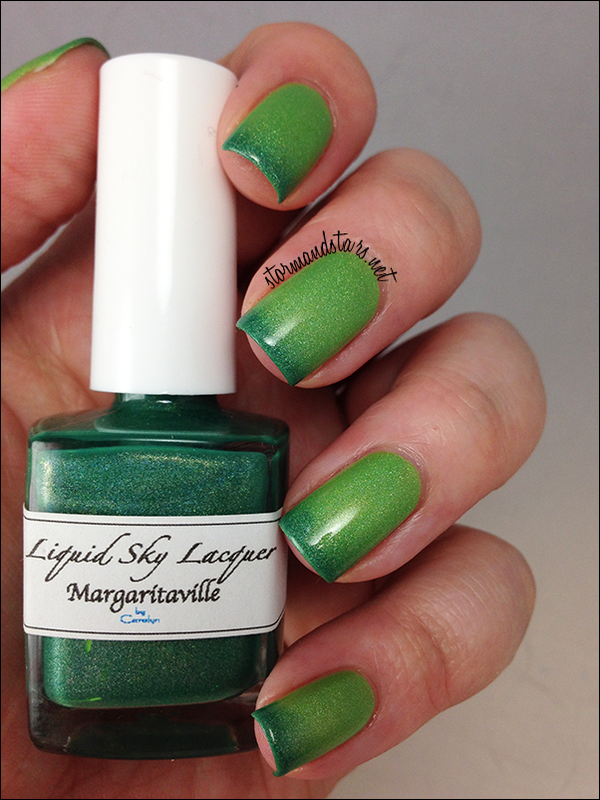 Carmel Apple and Margarittaville...I'm speechless! Beautiful swatches!